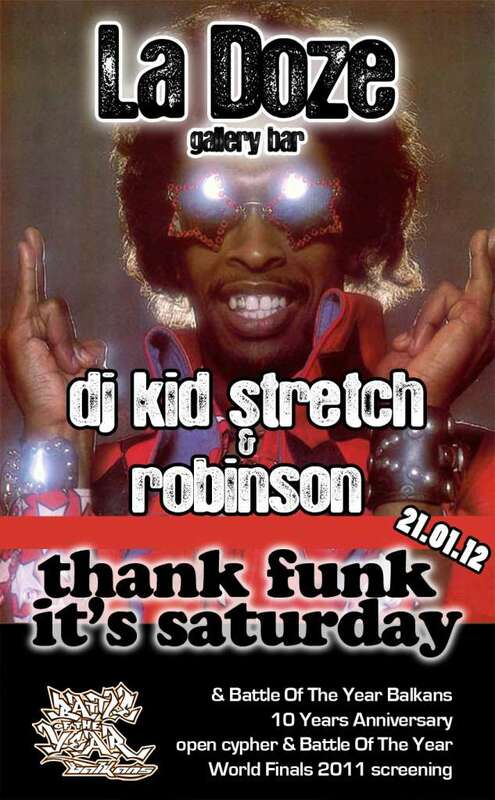 After the first funk bomb event, producer & DJ Kid Stretch (Goodgroove Records, Manmade, Big M, Boogie Boutique, VIM, Warriorz, Pig Balls Record) and Robinson (one of the most active DJs' of our town at the moment) return for another groovy night full of funk, disco and funky breaks. Catch the two funkateers at La Doze, also celebrating the Battle Of The Year Balkans 10 Years Anniversary, with open cypher for the bboys and the screening of Battle Of The Best World Finals 2011. Support the funk in yo town!